Factoring in the latest advancements in mobile and cross-channel communications, ContactLab, powered by Message Systems Momentum software, defined a methodology blending technology, marketing services and business intelligence to help clients build effective marketing campaigns using email, SMS and surveys. Specific case studies, best practices and benchmarks will be shared to inspire you! Today's customer dictates how the conversation flows with brands. To reach consumers you often have to do it on their terms and through the multiple channels they use. Get it right, however, and you will see engagement rates increase. In this webinar, Holger Bürger, Director of Operations, XING and Dain McCracken, SVP EMEA, Message Systems, will show how Xing built its brand relying on user preference data to better meet customer expectations for information and frequency of interaction. 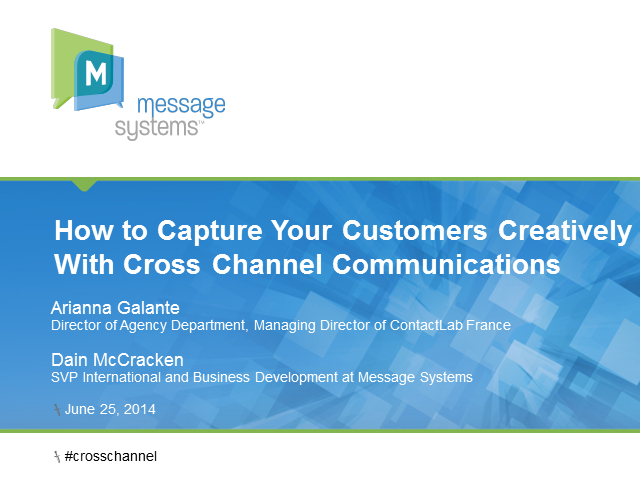 Watch this webinar to learn how your company can grow engagement from smarter messaging. In September 2012, The Relevancy Group surveyed over 400 email marketing executives. Interviews with these experts yielded the discovery of a number of crucial practices and techniques that separate the best performing email marketers from the rest. David Daniels — CEO of The Relevancy Group, and formerly Vice President and Principal Analyst of Forrester Research — now presents these survey findings in a new webinar: Unlock the Potential of Email Marketing. View and learn more about the best practices and techniques the highest performing email marketers. Just for starters, you’ll learn how you can increase your revenue by 30% and earn more on each email. The webinar wraps up with a brief Q&A between Daniels, Stephanie Nuzzo, eLearning Event Coordinator with eM+C magazine, and John Pinson, Senior Manager of Content Marketing with event sponsor Message Systems. In September 2012, The Relevancy Group surveyed over 400 executives familiar with the technology that fuels their company’s communications. Interviews with them yielded the discovery of crucial practices that separate the best email senders from the rest. David Daniels — CEO of The Relevancy Group, and formerly Vice President and Principal Analyst of Forrester Research — and Mike Hillyer, Senior Director of Global Solution Consulting at Message Systems will now present these survey findings and launch into a discussion of the best practices and techniques surround email deliverability. Message Systems and guest speaker Julie Ask, Forrester Research, Inc.
It’s no secret that companies today need a mobile strategy in order to communicate with their ever increasingly mobile audience. But putting together an effective and cost-efficient mobile engagement strategy is no easy task. Your mobile strategy must tie-in to your existing communication practices to enable true cross-channel interactions, and so that your company is speaking with one voice. Your newer front-end mobile applications technologies should work seamlessly with your more established back-end operational or transactional systems. Your mobile strategy must constantly be reassessed. Mobile technology is experiencing an incredible pace of change. What might have been acceptable a year or even just six months ago, might no longer be enough. How mobile is changing the engagement model with customers. Why ESPs Need to Move Beyond Email – Now! Customers today control when and how a brand’s messages are viewed. So, multichannel marketing is essential for interacting with customers when they want and how they want. But it’s not easy! 39% of marketers agree with the statement: "We lose business because we are not able to integrate customer interactions across all channels." And 49% of marketers said they found it hard to consolidate customer feedback from multiple channels. Marketers today are looking for providers who can help them with multichannel campaigns – no longer just for email programs alone. Multichannel marketing allows them to take advantage of all the ways they can engage with their customers. Done poorly, a multichannel campaign can alienate customers by bombarding them with emails, text messages, and social network notifications. Done well, a multichannel campaign can smoothly maintain customer engagement over multiple devices and channels. Access to multiple digital channels where their customers would be most receptive to receiving messages.